*Disclaimer: I received this wine as a sample from the PR folks for Mondavi. 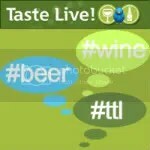 I don’t do a lot of blind tasting. However, I’m trying to do a bit more, if for nothing else other than to test my guessing skills. I made Matt go get something from the basement and he handed me a glass without telling me anything about it. I only knew it was a white wine. 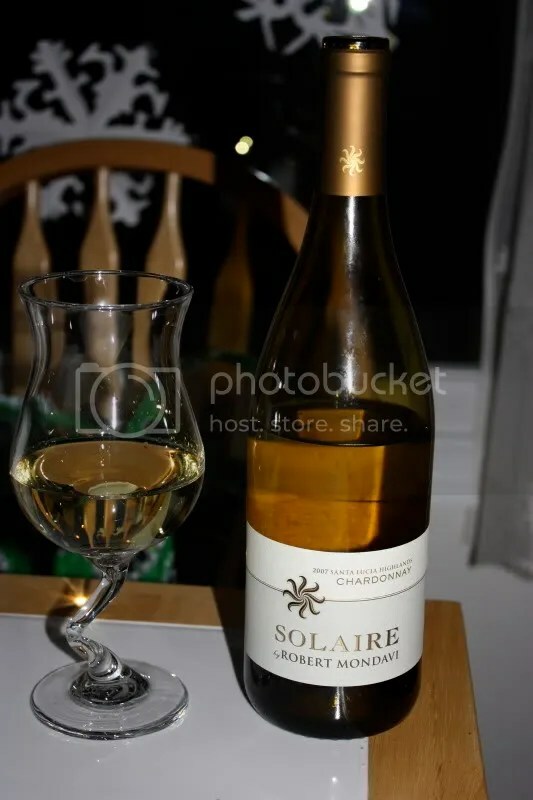 This one turned out to be easy…one whiff told me this was a CA Chardonnay. 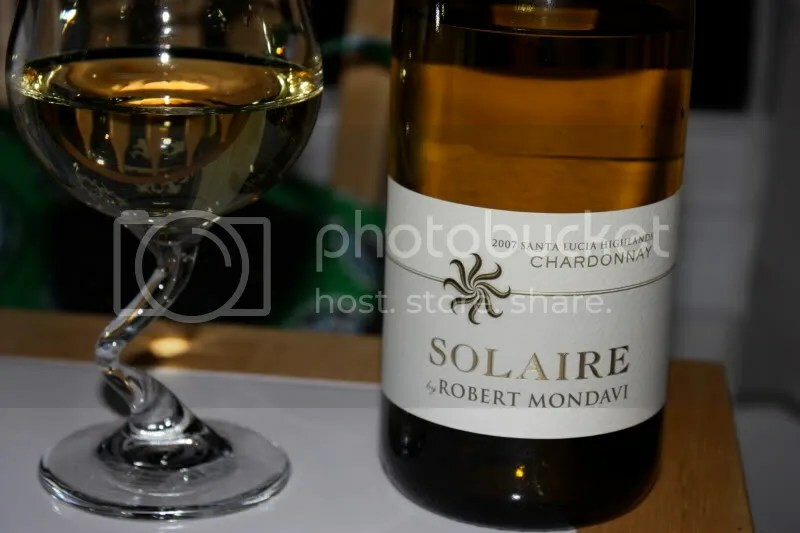 He had selected the 2007 Robert Mondavi Solaire Chardonnay. It had a real cork closure, clocked in at 13.5% alcohol by volume, and suggested retail is $15, though I see it online for about $13. The grapes in this Chard hail from the Santa Lucia Highlands. What told me this was a Chard? Toast and butter. After that I got pear, yellow apple, spice, banana, tropical notes, smoke, coconut cream, and spicy pear. Not a bad start with the nose, but it leaned just a bit too much into toast and butter for me. Where it went downhill a bit for me was in the mouth. In the mouth I found apple, pear, spice, and lemon. The fruit showed as really round on the palate and didn’t offer as much acidity as I would have liked. Again with that whole moving thing, I uncovered wines that have been hanging around for quite some time in corners and under books and such. This was another one I found while moving. It was a 2004 Robert Mondavi Private Selection Cabernet Sauvignon. I *believe* I picked this up for around $10 at Costco in August, 2006, but I could be horribly off on the price. Whatever the case may be, I remember buying it because I was in Costco picking up cheap bottles of wine for a large group of people we were having over. As is turns out, none of the wine actually got consumed that day and I ended up with a mish-mosh of cheap wine hanging around. Such is life. On the nose were berries, mostly blackberries, with maybe a little blueberry perhaps from the Petite Sirah blended in and alcohol, despite the bottle only being 13.5% alcohol. After that blew off, there were aromas of vanilla and oak. In the mouth I found mostly blackberries. However, after it had been sitting out for a while, there were other dark fruits present, pretty much indistinguishable, but perhaps cherries? I served it with keilbalsa off the grill, rice pilaf and green beans. It was a quick meal that I threw together after a long day spent tiling and grouting and I didn’t want to open a pricey wine with it. For $10 the wine was simple, fruity, and drinkable, though the strong alcohol scent and presence really surprised me given the low level.